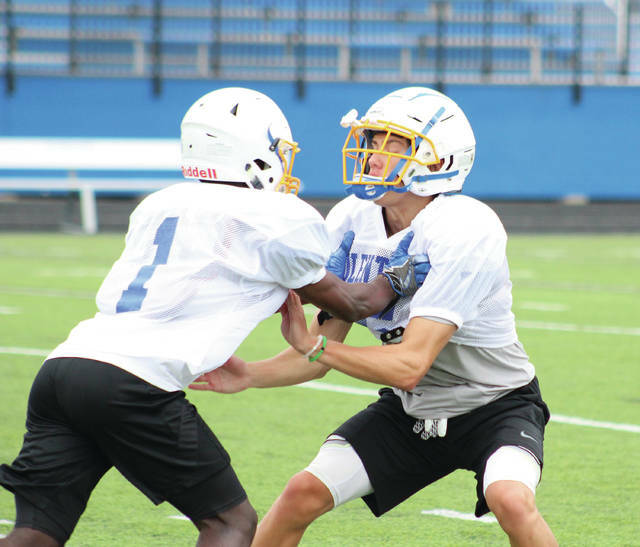 Defensive backs Hassan Radda (1) and Luke Riedel work on a drill during two-a-days earlier this summer at Olentangy. Olentangy’s Caden Kaiser hauls in a reception during a practice earlier this summer. Aug. 24 — Vs. Hilliard Darby, 7 p.m.
Aug. 31 — @ Miamisburg, 7 p.m.
Sep. 7 — Vs. Holland Springfield, 7 p.m.
Sep. 14 — @ Dublin Coffman, 7 p.m.
Sep. 21 — Vs. New Albany, 7 p.m.
Sep. 28 — Vs. Westerville South, 7 p.m.
Oct. 5 — @ Olentangy Orange, 7 p.m.
Oct. 12 — @ Olentangy Liberty, 7 p.m.
Oct. 19 — Vs. Westerville North, 7 p.m.
Oct. 26 — @ Westerville Central, 7 p.m. The one thing the Olentangy football team didn’t lose to the new Olentangy Berlin High School is coach Mark Solis’ confidence. He should have confidence. It’s earned. Solis is 148-63 with 10 playoff appearances in 19 seasons as a head coach, with a pair of league titles and four playoff bids in five seasons at Olentangy. It’d be easy to think Olentangy would take a step back because of numbers. That part is true … its numbers are down. Olentangy has 72 players on its varsity roster this year as opposed to 77 last year, with 15 players going to Berlin. It has had to fill some of those spots with freshmen (18 this year as opposed to just two last). But looking around, there are a lot of familiar faces … or hands, rather. 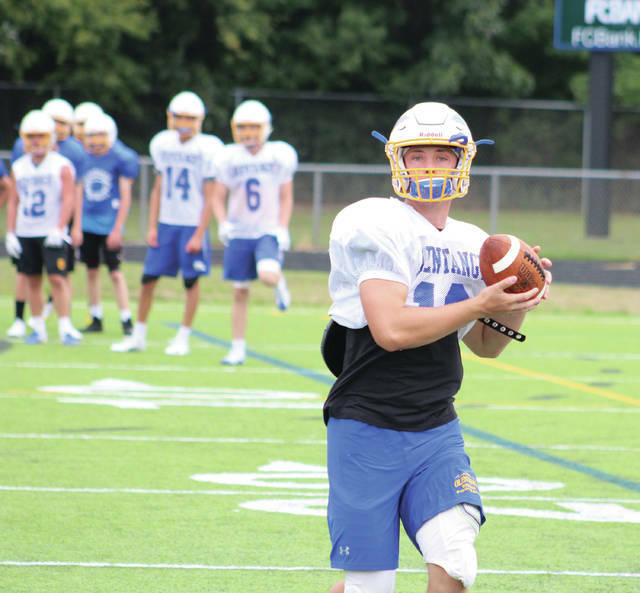 Seniors Caden Kaiser, Ian Drummond and Luke Riedel and junior Jace Middleton were all key parts of the Olentangy offense as receivers. He also has some new faces that should make an impact like juniors Jake Coleman and Josiah Seymour and sophomore Caleb Gossett. Solis has to decide between Connor Haag (senior), who has some starting experience, or Trent Maddox (junior) at quarterback. Senior center Zach Martin is the only one back on the line with experience. Solis will mix and match between Jake Takach (guard), Rylee Geyer (guard), Mike Hawkins (tackle), Jacob Dunbar (guard) and Colton Doup and sophomore Toby Wilson (tackle) at the other positions. Seniors Zach Shiblaq and Trevor Solis are not only going to make an impact running the ball, but on defense. Shiblaq is penciled in at one of the outside linebacker spots and Solis will play some defensive end. Drummond (end), Takach (tackle), Doup (linebacker) and Riedel (cornerback) will also double-dip. Seniors Nick McCafferty (linebacker) and DeAnte Ables (cornerback) are a couple of key returnees to the Olentangy defense. McCafferty is the team’s top returning tackler and Ables led last year’s squad with five interceptions. For Solis, the goals are the same as they’ve ever been. “We’ve kind of set a standard over the last five years that we expect to contend for championships and that’s the expectation this year,” Solis said.